As I write this, I have just returned from an extended shooting session with Ruger's newest single-action revolver; the Super Blackhawk Hunter. 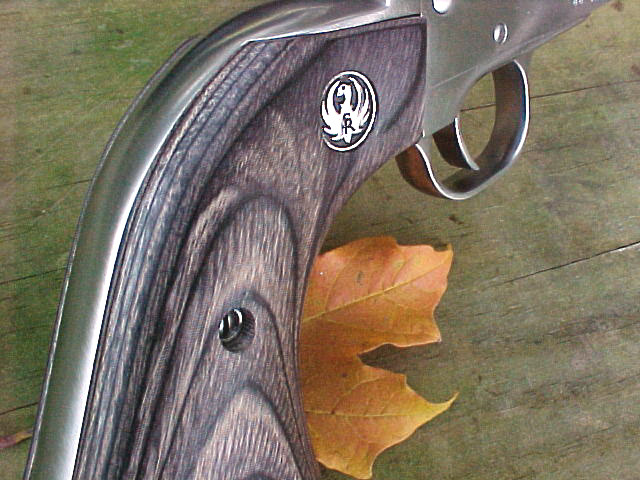 Actually, the Hunter is a return of a fine sixgun produced by Ruger several years ago. The return of the Hunter to Ruger's Super Blackhawk line fills a much needed void among handguns in general, and single-actions in particular; that being a sixgun purpose-built with the handgun hunter in mind. Until now, if a hunter wanted to mount a scope sight on his Ruger Blackhawk or Super Blackhawk, he had no really good means to do so. With the addition of the Hunter to their line, Ruger has taken the excellent scope mounting system from their double-action Redhawk revolver, and added it to the Super Blackhawk. 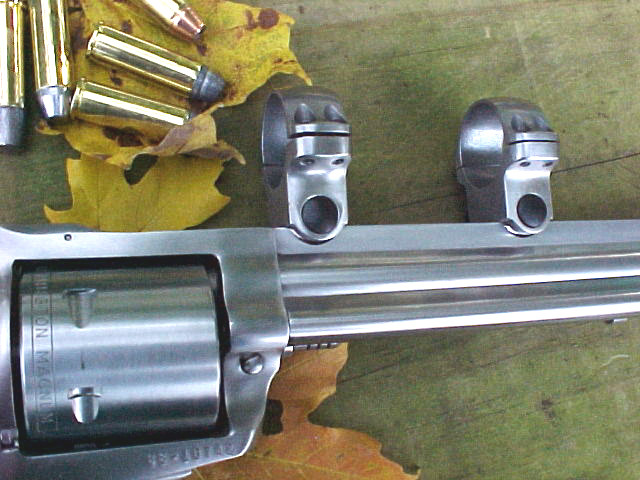 The scope mounting system of this sixgun mates Ruger's great stainless rings with an integral full-length solid rib machined onto the top of the seven and one-half inch barrel. This system makes for one of the strongest scope mounts in the industry. The scope rings can be removed and replaced, with the scope mounted firmly within, without a measurable loss of adjustment. Upon learning of Ruger's intention to re-introduce the Hunter, I immediately put in a request for a sample. 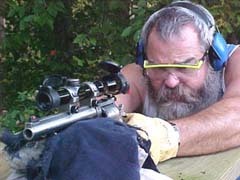 The gun received for testing here at Gunblast.com came supplied with Ruger's usual hard plastic protective case, cable lock, instruction manual, and a set of stainless one-inch scope rings. The Super Blackhawk Hunter, while built for ruggedness and durability, is an example of classic sixgun beauty. The brushed satin finished stainless steel looks great with the well-fitted black and gray laminated wood stocks. The 7-1/2 inch barrel with the heavy top rib gives a definite muzzle-heavy balance to the sixgun that really helps to achieve a steady hold while shooting. The Hunter is a substantial sixgun, made almost entirely of stainless steel, and weighing in at 52 ounces. Chambered for the .44 Magnum cartridge, the Hunter can handle a great variety of factory and handloaded ammunition. 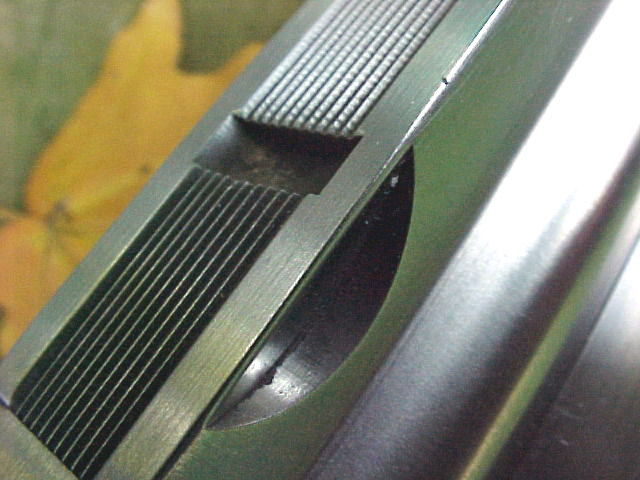 The heavy rib atop the barrel is grooved most of its length to prevent glare. The top of the frame is stamped with the same Hunter logo as the original series of this revolver, and is both unique and aesthetically pleasing. This is one great-looking sixgun. The Hunter includes several nice features that serve to make the gun more user-friendly, such as the excellent wide hammer spur that is serrated and lowered to fall more easily under the thumb. 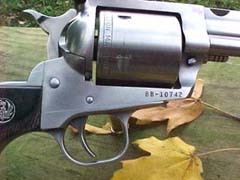 The rounded trigger guard is a deviation from the standard dragoon-style guard of most Super Blackhawks. The extra-length ejector rod is the same as the rod from their ten and one-half inch barreled Supers, and helps to ensure complete and easy ejection of magnum cases. The interchangeable front sight system is another nice feature borrowed from the Redhawk, allowing a shooter to more easily adjust his sights for load and shooting conditions. The trigger pull on the Hunter, while smooth, weighed in at around six pounds. Removing one grip panel and lifting the leg of one side of the trigger spring from its post resulted in a nice pull weight of around three pounds (for details of this procedure, see Jeff's article at Poor Boy's Trigger Job). This makes for a much better trigger pull for accuracy work, and can be returned to the original factory weight just as easily. The unfluted cylinder exhibited a slight amount of side play with a barrel / cylinder gap of .004 inch. Cylinder end play was tight, with no discernable amount of movement. The grip frame was very well fitted to the frame, as were the stocks to the grip frame. All surfaces were evenly and very well finished, with no visible tool marks. Beauty aside, the proof is in the shooting. 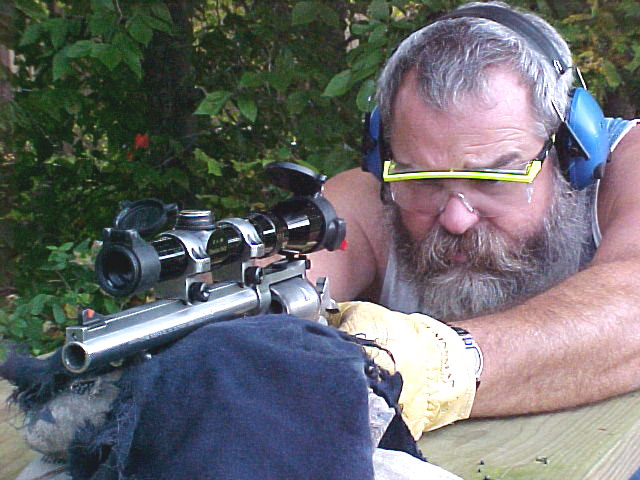 For group testing, I mounted a trusted old Charles Daly 2-power pistol scope. As can be seen from the photos, this sixgun will shoot! All shooting was done at a range of 25 yards, and chronographed over the excellent PACT Precision chronograph at a distance of twelve feet from the muzzle. 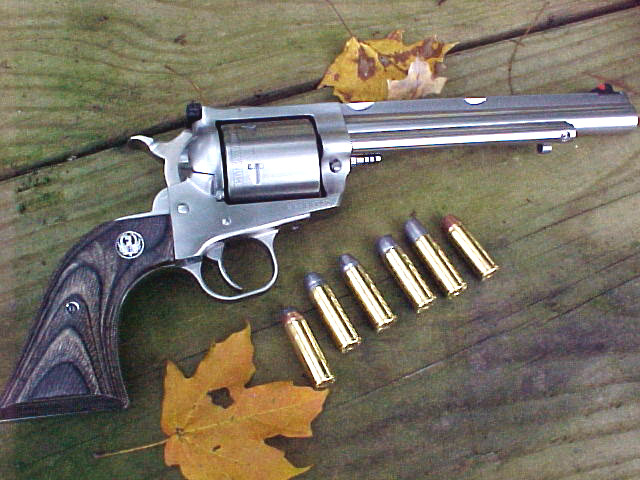 Each and every load tested gave very good performance in this revolver, with the worst group fired measuring one and three-sixteenths of an inch. That was the worst group, and would be called a great group in most any other sixgun. 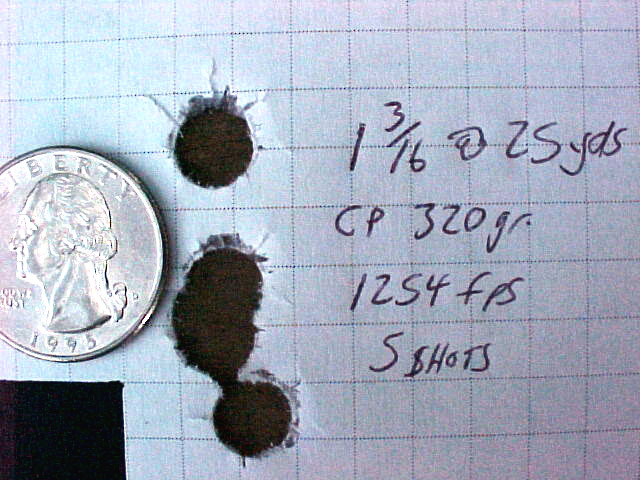 The best group fired measured an even half-inch for five shots at 25 yards. Every other load tested went under an inch for five shots. After evaluating the chronograph data, the largest group also was very inconsistent, and could be improved by the addition of a little more powder. 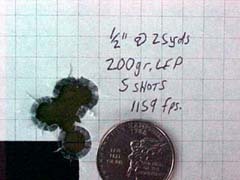 Bullets tested weighed from the lightest at 165 grains up to the heaviest at 320 grains. The gun performed well with light and medium weight jacketed hollowpoints, and with light, medium, and heavy weight cast bullets. One load in particular deserves special mention; that load being the Cor-Bon .44 Special factory load using their 165 grain jacketed hollowpoint bullet. 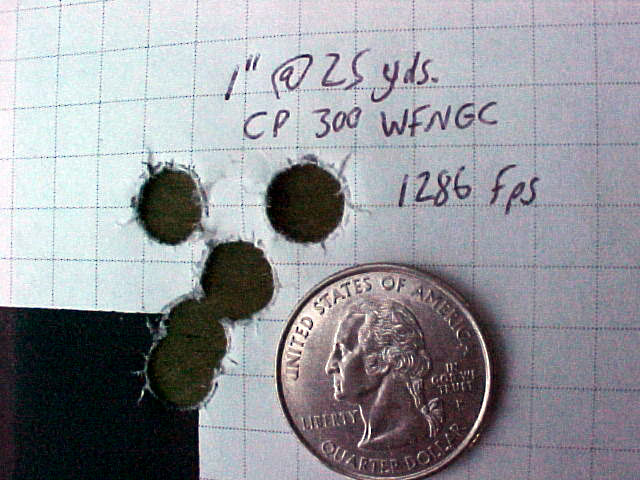 This load is advertised at a velocity of 1150 fps, but chronographed from the Hunter at 1255 fps at 10 feet from the muzzle. This load was very accurate from the Hunter, and should prove ideal on whitetail deer, giving good expansion without excessive recoil or meat damage. 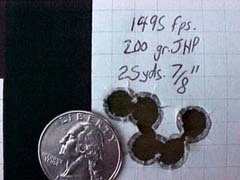 The rounded trigger guard proved very comfortable shooting even the heavy Cast Performance 320 grain bullets at a speed of over 1250 feet-per-second. 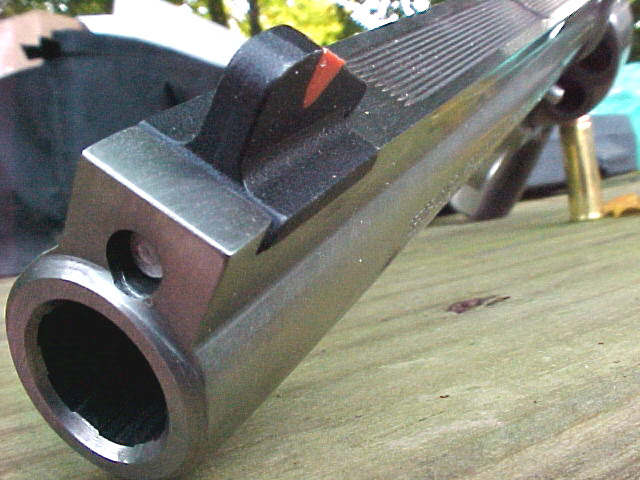 The long Super Blackhawk grip frame provided good control of the gun even with the heavy-recoiling loads. This Super Blackhawk Hunter is one of the most accurate handguns that I have ever fired. Some shooters, myself included, prefer a sixgun without a scope sight for hunting and shooting. 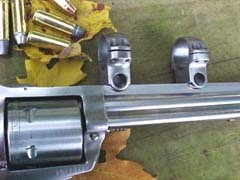 Even without the benefit of the capability of mounting a scope, this revolver has many advantages. I really like the balance of the sixgun afforded by the heavy barrel rib. I like the long ejector rod and the interchangeable front sight. I like the feel of the long grip frame with the rounded trigger guard. I absolutely love the accuracy of this revolver. Especially in a sixgun designed for hunting, accuracy is everything, and this gun has accuracy to spare. Coupled with the advantage of being able to easily mount a scope sight when desired, the Super Blackhawk Hunter has it all. It combines the rugged simplicity of Ruger's famous single-action design, with the safety of the New Model lockwork, the durability of stainless steel, and the accuracy of a target pistol, into one of the best-looking sixguns to come from a factory in the last forty years. I really like this sixgun; if I didn't, I would say so. I tried to find some small thing wrong with the gun, but it just wasn't there. 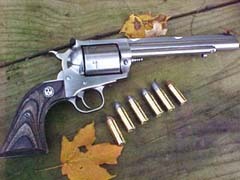 Perhaps later Ruger will offer this fine sixgun in a greater variety of calibers, from the .357 through their own .480 Ruger, but that is just wishful thinking on my part. For now, the .44 Magnum will do just fine. Ruger's excellent Super Blackhawk Hunter model, shown with some of the loads tested by the author. The Hunter is fitted with a rugged and beautiful set of gray laminated grips. The example tested displayed excellent workmanship overall, with well-fitted grips and no visible flaws. Ruger's integral scope mount system, as found on the Redhawk and Super Redhawk DA revolvers, is the heart of the Super Blackhawk Hunter. Author considers this system to be the finest ever devised for mounting a scope on a revolver, allowing the rings to be removed with the scope without measurable loss of zero and maintaining clean lines when used with iron sights. The grooved barrel rib with integral scope mounts also features a rugged but easily interchangeable front sight. Many different sight types are available, including bead types (with "V" rear sight blades). Different heights are also available, with or without colored inserts. The extra weight of the barrel rib and interchangeable front sights are very desirable features even for the hunter who prefers not to mount a scope on his handgun. 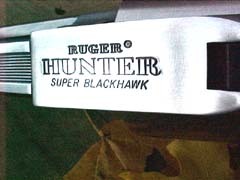 The new Super Blackhawk Hunter features a special roll-mark designation on top of the frame, as did the originals. 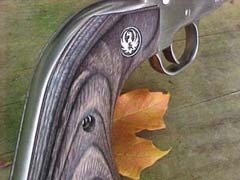 The Super Blackhawk Hunter has the unfluted cylinder and excellent hammer design of the Super Blackhawk, with the added feature of a rounded Super Blackhawk trigger guard. Author likes the grip shape of the Super Blackhawk, but the "dragoon-style" squared trigger guard of the standard Super Blackhawk can wear out a shooter's knuckles with heavy loads! The Hunter's grip frame is the best of both worlds. 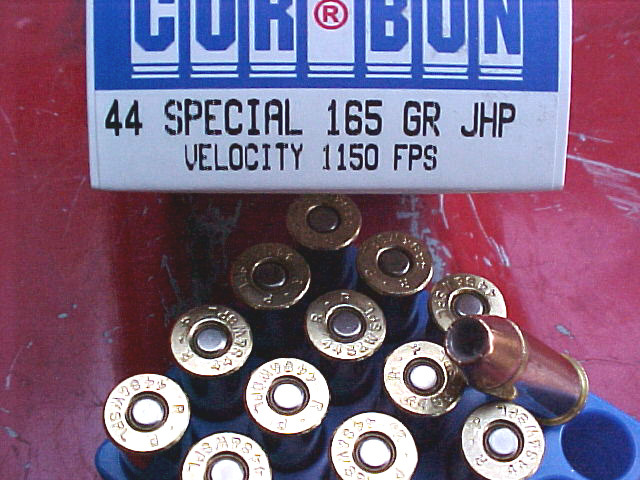 Cor-Bon's 165 grain .44 special load was among the author's favorite loads for the Super Blackhawk Hunter. Clocking at 1255 FPS, this should prove an exceptional factory load for whitetail deer. Ruger's Super Blackhawk Hunter showed exceptional accuracy with a variety of loads, ranging from Cor-Bon's 165-grain JHP to Cast Performance's 320-grain LBT-style cast bullets. The worst groups were 1-3/16", with the best grouping at 1/2"! Author was very pleased with all aspects of the Ruger Super Blackhawk Hunter, and gives it his unqualified recommendation. A reliable and beautiful hunting companion with accuracy to spare, the Hunter has few peers in today's market.